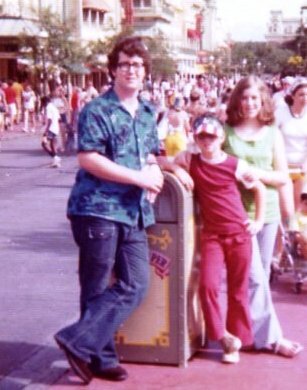 Me with my two brothers, all in bell-bottoms. When Disney World opened in 1971, it was the place to go and take the relatives that came to Florida to visit us. Being just two hours away, we would go and come home the same day. We went quite a few times in the early 70s. I had lots of fun with my brothers and cousins during those years. Yes, it was crowded but that doesn’t matter to a kid. It was just magical being there. Space Mountain, the Hall of Presidents, the Haunted Mansion, all the oldies but goodies. Then, in my senior year of high school I experienced the magic of Grad Nite. This after-hours event for high school seniors was wonderful. There was actually a dress code! Girls could wear dresses or pantsuits the year I went. I’m sure that changed over the years. But, in 1976, I was able to see and dance along to KC and the Sunshine Band, as well Natalie Cole, Ohio Players and Harold Melvin & The Blue Notes. I haven’t been to Disney for a while. It’s just not the same as an adult. Well, okay, I know some “adults” who go all the time, but that’s using the term lightly. I’m not talking about parents taking kids. I’m talking adults going sans kids, some even sans a friend. I can’t think of anything more depressing than being at Disney alone. For the record, I DO hope one day to experience the magic again – though the eyes of my grandkids. I will gladly listen to “It’s A Small World After All” 49 times if I have to. Can you say “bippity boppity boo”? I have no idea where this picture was taken, but I think it was around 1961. I’m the youngest one in the photo. The little boy is my brother, David. The other four are my cousins, all siblings. I’m thankful for my cousins. I have so many wonderful childhood memories with all of them. The four in this picture are all older than me, so they probably have a different viewpoint than I do. This is how I remember…. Johnny, the tall boy in the back, was the oldest child in his family. All I remember from visits to their house as a kid is that he was there. Then I remember he went to fight in Vietnam. I didn’t understand much at all of what was going on at that time, but I do remember being very glad he returned home safely. He’s now married, living in Texas, with two daughters and bunch of grandchildren. I know him a little better now. What I appreciate about him the most is that he wrote letters to our grandmother over the years. He is a kind man. Linda is the one with the long dark hair. She and the next in line, Susan, used to make paper dolls for me, complete with several outfits. What I remember most about her is the summer she stayed with us in Ft. Lauderdale. She was supposed to be helping my mom, who was expecting my younger brother. Mom says that’s not what happened, the helping part, I mean. My most vivid memory of that time is when she came home extremely sunburned from a day at the beach. That Georgia girl did not listen to the admonitions to protect her skin. A week or so later my older brother and I would sit and peel layers of flaky skin off her back. It was fascinating at the time – I was 5 ½. Then there is Susan – the one with her arms around me. We share the same middle name – after our great aunt Marie who didn’t have children of her own. Susan played the flute and had long straight hair in high school. I loved her hair and used to spend time watching her fix it just right. I was also fascinated with her eyelash curler. The youngest in this group of siblings is Patricia. She spent one summer with us when I was an impressionable young teen. She answered lots of girl-stuff questions that I was embarrassed to ask my mom. She married her high school sweetheart and they are still together. Cousins are wonderful people. Even though we lived miles apart, my cousins were all a big part of my growing up. I am grateful for the richness they added to my life.